Picked 2 tubs of juicy, sweet blackberries, a big bunch of sweetpeas and was donated a patty pan squash from a neighbour – I’ve tried unsuccessfully to grow them 2 years running and it will be lovely to find out what they taste like. 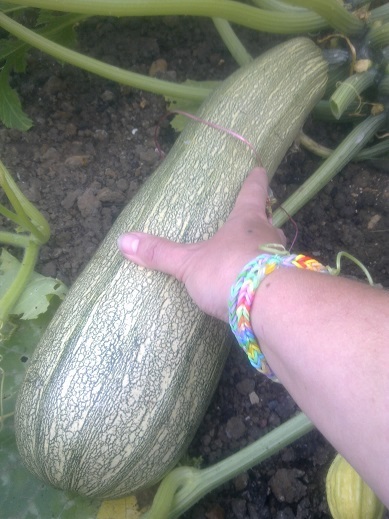 The 2 seed circle courgettes are very big and are starting to turn colour slowly. I need to do some more research on how long to leave them, but I reckon about another month. Those plants have completely stopped fruiting. The Trail of Tears beans are still only a foot high, but are at least starting to climb and there are a few flowers on the Albertos and maybe that means they are about to take off. Fingers crossed. I’ve taken up the Charlotte foliage and removed the ‘apples’ from the Desirees in advance of my nieces coming on the weekend. Am leaving the spuds in the ground for them to help me harvest. If I am lucky the redcurrants will last and some tomatoes will turn. Am doing some more research on ways to get rid of horsetail given the reaction by other tenants to the kurtail proposal. My assumption was that we needed to get the plot ready for re-letting as soon as possible and spraying is the only way I’ve found to do that. Some of them think that someone on the waiting list would take it in its current condition for a year’s rent waiver. Personally I doubt £32 makes that much difference given the challenge it presents, but I’d be very happy to be proved wrong! Moved my spindly kale seedlings out of slugs’ way. 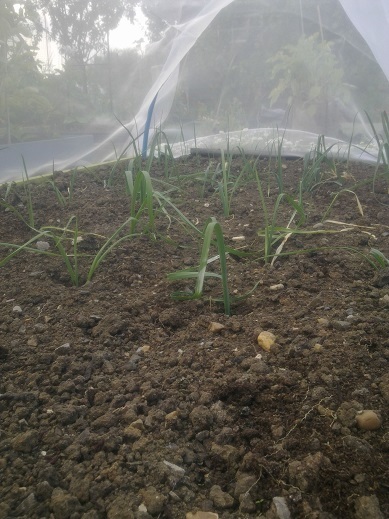 I’m very glad to see the leeks are standing up post-tranplant. Am actually missing digging a little, and hope I get some time this week for a bit more. The dehydrator is now full of one huge courgette that I am hoping will be turned into delicious and healthy crisps in another 10 hours. If I/we like them, I have another 4 I can use. Sowed another batch of Little Gem lettuce as the ones on the balcony are doing so well. Also sowed a small pile of chioggia beetroot – the wind caught the packet and they spilled everywhere. Thankfully there were over 500 in the packet so not everything fell out. I’ve had really bad luck with beets this year, even module-sown – the slugs have eaten all but 6. So this is a last effort to start them at home and transplant on the plot. With many pellets.